When setting up a complex cutter for the first time, e.g. 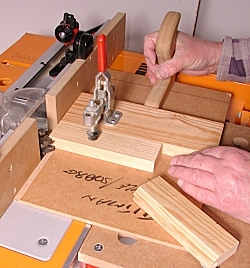 a profile/scriber or a lock mitre cutter, the job is likely to take some time. When you’ve got the two parts of the joint exactly right, cut off a length of each test piece, label it and keep it as a setting piece for the next time you use that cutter. This will save you endless time and frustration if you use the cutters frequently.